Developed by Iron Galaxy and published by Modus Games comes the hack and slash action game Extinction which is available on consoles and PC. You play as one of the world’s last Sentinels called Avil, a hero who comes equipped with some fancy footwork and demon busting sword. The world is being invaded by the Ravenii (giant orc looking beasts) and their minions and so it’s up to Avil to hot foot it across various locales to take them out and rescue as many civilians in the process. Sounds neat right? Extinction offers several modes of play, but it’s the campaign where players really need to dig in first because it’s here where Avil can amass points and level up or earn new skills which then carry over into the other modes on offer. The campaign also introduces some context as well as a tutorial chapter to get things started. In a nutshell, there are themed objectives across the campaign which consist of either rescuing X number of civilians, killing X number of Ravenii, Protecting towers from being destroyed or killing a set number of Jackals (minions). The key to success aside from leveling up Avil’s skills is building up a Kill Strike meter by killing Jackals or rescuing civilians which then allows him to decapitate the Ravenii heads, killing them in the process. Avil can take out limbs to slow down the Ravenii but they quickly grow back. What is neat is that as the story progresses so do the Ravenii types. To begin, these towering beasts simply come as basic giants but then come equipped with different types of armour and even weapons. Each Ravenii requires slightly different tactics which plays heavily in the missions where there is race against the clock as the level is obliterated by several Ravenii at once. Deciding which to mount the attack on first becomes a little tactical especially if using an easier opponent to build up your meter and then unleash the killing blow on the tougher more armored foe. Each level is filled with structures and trees which Avil can freely climb, jump on and bounce off. He can glide in the air and even use a whip to reach higher ground quickly. The verticality is pretty neat as is being able to freely move around the levels. Unfortunately, due to the pacing there isn’t much time to sit and admire the surroundings as the combat takes precedence here. Either on the ground or in the air there are several combos to unleash as well but to be fair, players can easily proceed via button mashing. So, it’s not all plain sailing though and whilst traversing the levels is fairly fluid, there are some design quirks which can grate. For starters, some missions opt for a random generated set of parameters which can be pretty unbalanced. Success or failure really can hinge on which Ravenii appear or not making some missions seem harder than they need to be. There are also some issues with the camera at times especially when locking-on to breakable parts on the Ravenii or climbing their giant hides. It’s not always player friendly and can result in mission failures or death. Luckily Avil doesn’t ever die and just respawns back in the level with some lighthearted comment from side-kick Xandra. Players can also get stuck amongst civilians and parts of the scenery at the wrong times making for some frustrating moments when racing against the clock. Luckily none of these issues are game breaking but worth noting all the same. A little more mission variety would also have been welcome as the game’s limited offering does get somewhat repetitive. Visually, Extinction offers a pleasant animated look with a decent set of destructible themed environments to play in. That said, there are few Jackal types and the Revennii seem to differ based on what amour they sport. A bit more enemy variety here could have made for more interesting gameplay. The game easily runs at 4K 60 fps using top end hardware and has a few options to tweak in the settings to suit your requirements so no complaints there. Audio is pretty standard fare with dramatic music where it counts and dialogue from the main characters leaning on the comical side at times thanks to a witty script. Aside from numerous mission restarts and replaying levels to snag all of the side objectives you can probably beat the 7 chapters of the campaign in around 10 hours or less. Then there are the Skirmish and Extinction modes as well as a daily offering to compete with others via leaderboards. Sadly, there is just not much variation and after so many hours repeating the same tasks means mileage will vary. 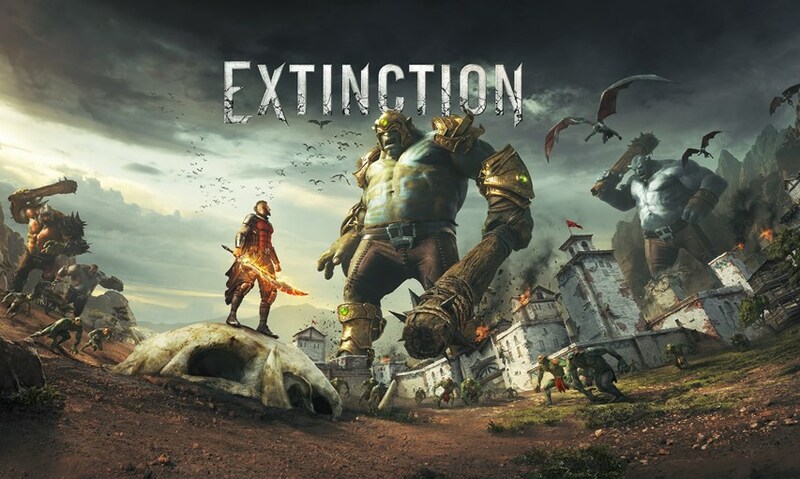 Extinction is a fun game to play in short doses but does have its fair share of frustrating moments, most notably the tower defense missions where failure after so many minutes feels a little on the cheap side. As mentioned, the idea of randomized levels sounds good on paper, but due to skewed balancing means that it comes across as unfair rather than offering variety. Still, those who enjoy a challenge, some free-running and visceral combat will enjoy what’s on offer here. It’s a fast paced no-nonsense game which could do with a little more content to stand out. However, the high asking price £49.99 is perhaps too much and can only be fully recommended when the price is lowered.